Google launched an experimental service that would've been perfect for Google Labs: Hotel Finder. The service lets you find a hotel in US and it has a few clever features that make it stand out. You can add shapes to the map to restrict the list of results to your favorite areas. Google highlights the most popular areas to help you. 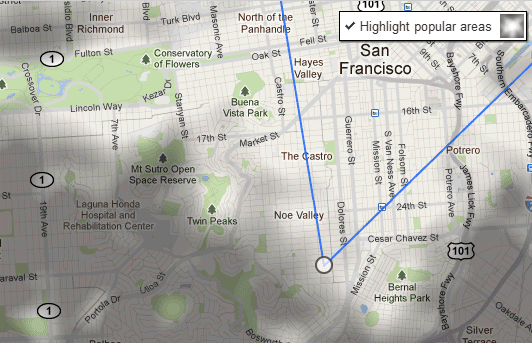 By default, Google creates a shape based on the most popular places. Using shapes to filter results is not an original feature, but it's useful and it's surprising to see that Google Maps didn't add it. 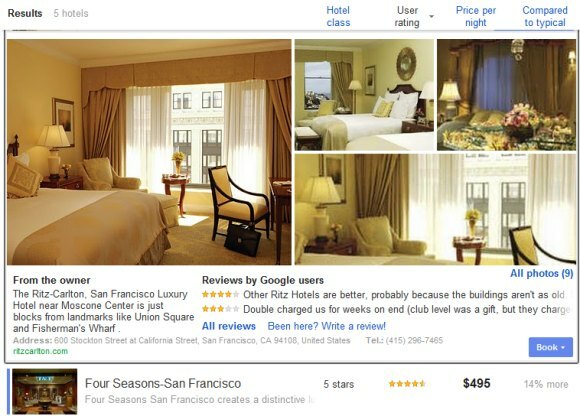 After selecting the location, Google lets you pick the check in and check out dates, choose a price range, a hotel class and restrict the results to hotels that have great user ratings. Another cool feature is that the results can be expanded inline so you don't have to open a new page to see some photos and read the reviews. Add the hotels you like to a "shortlist" to quickly compare them. Google Hotel Finder is also useful to find great deals. The "compared to typical" section offers some information that's not easy to find by comparing the current prices with the historical averages. Unfortunately, you can't book hotels using Google's service, at least not directly. 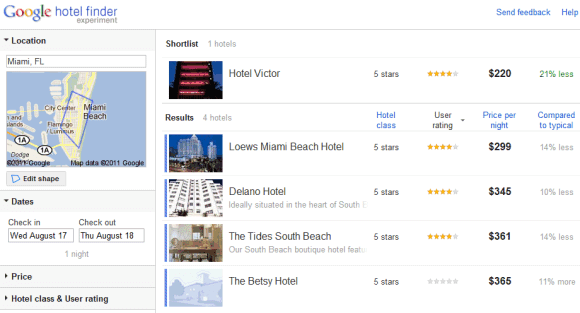 Google Hotel Finder sends you to sites like Booking.com, Priceline, Expedia, Travelocity. For now, Google Hotel Finder only works for US hotels, but it's a surprisingly strong offering. While there are many features that need to be added to compete with Bing Travel, Google's service is really promising. It's fast, easy to enough and offers helpful information that's not available elsewhere. It is too early to say whether or not Google's Hotel Finder would pose a threat to the different hotel search engines currently available. If at all, it may actually lead to their benefit. Majority of travelers do their search for hotels by typing in a particular landmark or address in the search box provided by many online travel sites, a feature that is not yet available at the Google Hotel Finder. Travelers can use the hotel finder to make a shortlist of hotels that are well within their budget. Since the hotel finder shows a list of the different websites where a hotel can be booked, the traveler can go to the site that offers the lowest possible rate for the hotel and do a search using a particular attraction or landmark they want to see or need to visit. They can then trim down their shortlist based on their distance until they are left with the best hotel to book. Of course, if Google does include a landmark or address search option in their hotel finder along with providing this service for travelers planning trips to other countries, that would be a completely different story. It's a promising feature, but I want to know that is it necessary that the Hotel should be listed in Google Maps? If not, then from where Google will fetch the data?